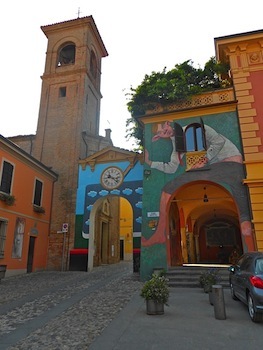 La Valle del Senio, in Romagna, like a necklace encrusted with precious jewels, is dotted with fascinating little borghi in which history and art live side by side and which offer a glimpse of contemporary Italian life apparently immune to the demands of modernity. Two such magical places are Brisighella and Dozza. Brisighella was founded in the 13th century by the Italian condottiere Maghinardo Pagano. The lords of Faenza began building the Rock of Brisighella a century later, which then took its final form during the lordship of Venice, in the 16th century. The borgo is formed of a labyrinth of ancient narrow streets, of which the most famous is Via degli Asini (Street of the Donkeys.) Over the town dominates the Pieve di S. Giovanni Ottavo, erected in the fifth century and enlarged between the 11th and 12th centuries. The lore of Brisighella is filled with interesting anecdotes and historical tidbits from ancient to contemporary times, and the town is perfect for leisurely walks – distances are short, the streets are well-kept, the traffic is minimal, opportunities for gelati and cappuccini abound. A local guide with detailed knowledge is available and will add immensely to the understanding of the town. 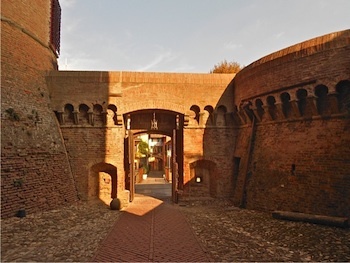 Dozza, another little artistic jewel, is only a few kilometers from Brisighella and is known for two things: one is the Rocca Sforzesca, built by Caterina Sforza in the late Quattrocento and later used as a palazzo signorile. 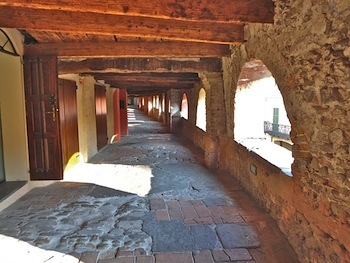 The borgo itself is of ancient origin, probably founded by the Gauls well before the Roman conquest. The Rock is powerful, massive, and was inhabited by the descendants of the Malvezzi, lords during the Renaissance, until 1960. Today the Rock houses a museum and a sophisticated wine bar in which all manner of local wines can be tasted and purchased. 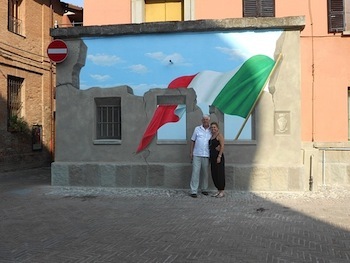 The second noteworthy thing about Dozza is the biannual festival of the Muro Dipinto (Painted Wall.) Every other year selected artists from all over Italy converge on Dozza and paint works of art on the walls of its palazzi, so that a walk through the town becomes a walk through an outdoors art gallery. Like Brisighella, Dozza offers the opportunity of a leisurely promenade with beautiful vistas across the Valle del Senio, and, above all, the opportunity to experience an Italy largely unspoiled by the influx of tourists and the pressures of modern commercialism.